Yes, I have run out of "Summer" clothes and have had to resort to my new thick, quilted skirt, which is very short! I featured it on a wishlist just before this post, but when it arrived I wasn't sure on it, however, I did decide to keep it as I really lack in bottoms. It's super short though, and I'd much prefer if it was high waisted... I forget that not all things are high waisted nowadays. Anyway, this post is scheduled (it's Tuesday today) so by now I'll have been to pick James up from the airport, at last (! ), and be at work. Boo. Oh, and I'm also going to apologise for how miserable I look in these pictures, I had the sun in my eyes and the pictures I take myself always come out rubbish! I was also contacted by Laura at Mallzee recently, and I don't usually do brand based posts on my blog but I really wanted to pop in a little information about this as it's unlike anything I've heard of before! Mallzee is essentially a new way of shopping online, it brings together different items based on your style (found out through a few questions at the setup) from different stores across the internet. I've been using it for a week or so, and I must say that it does save on the mundane scrolling through page after page on some of the bigger websites! You can also connect it with your friends, who can give you advice on your picks as well as general chit chat, so in that sense it's like a shopping social network. I also understand that through shopping on there, you earn Mallzee dollars, which you can then spend on the site... uh, getting paid to shop, alrighty then! Although don't quote me on it! Anyway, if you'd like to check it out then you will find the website here. 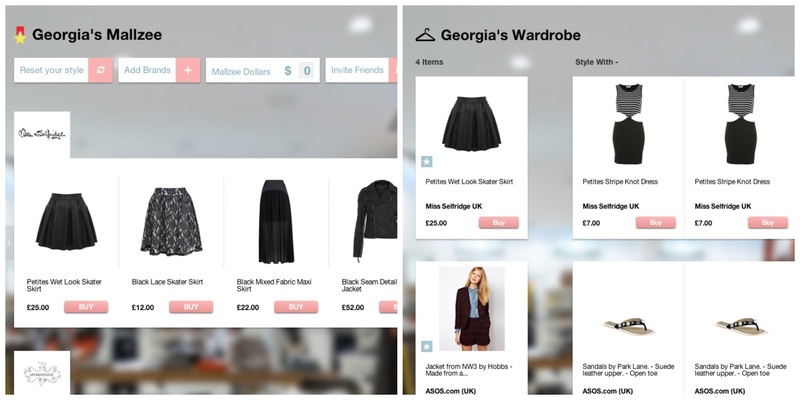 my Mallzee homepage and my "wardrobe" complete with styling options! I hope you're enjoying the sunshine! I've got a lot of little bits of news to tell you all, so I will do a little catch-up post soon! discount of the day: £15 off sale orders of £100+ with UO code "WINNING"
This is my favourite outfit post of yours, ever! My choies dress that you wore on here a couple of weeks ago has finally arrived and BOY is it short haha - you were right! Anyway. I have a necklace exactly like that but in gold, I really like the silver one! love your top and quilted skirt! !